I always get the urge to clean really well before the holidays. Between parties and dinners, we see more guests than usual. 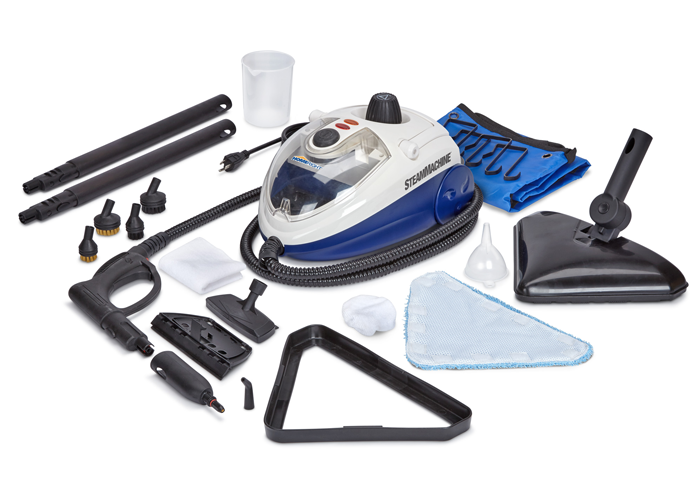 The NEW SteamMachine Elite is the prefect tool to get the job done. 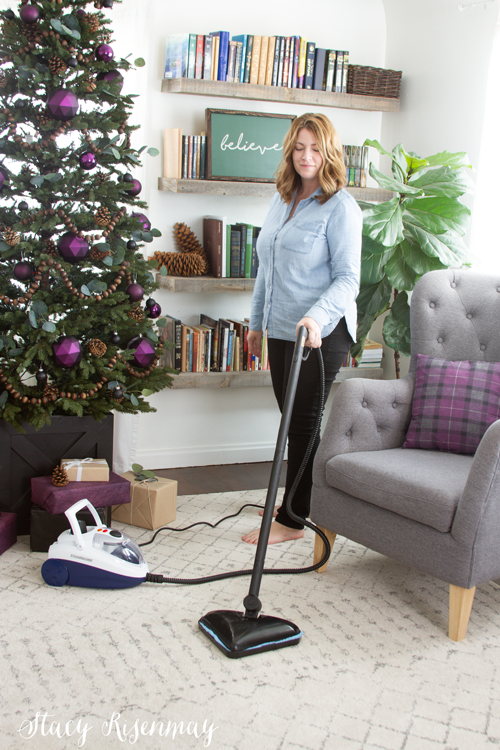 From linens, to floors, to kitchens, this is steam cleaner is perfect for freshening up your whole home for Christmas! The new SteamMachine Elite has everything you need to steam every surface of your home. It even comes with an accessory bag. I love to steam my area rugs. Living wth 4 boys and a dog can make them smell a bit like corn chips. Eww! After I vacuum I like to steam them to freshen them up! 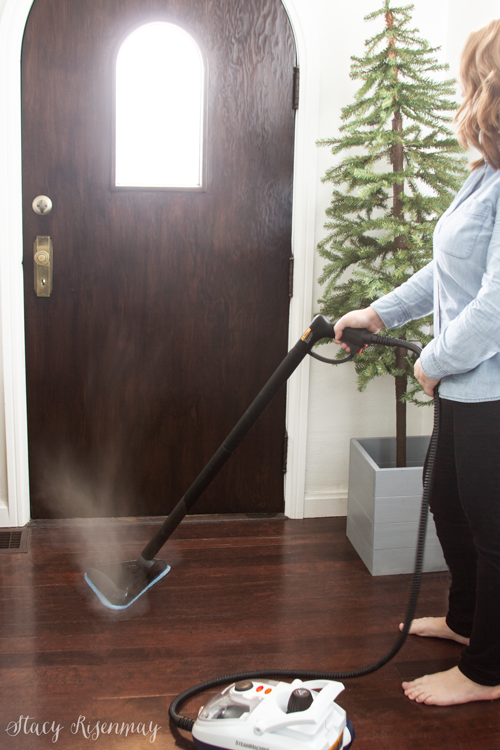 Just add the carpet glide attachment to the mop head and you are ready to steam! This set up also works on mattresses. Take off the carpet glide attachment and you are all set to mop! My entries get mopped the most, especially in the winter when they track in mud and snow. I store my holiday pillows in totes in the garage. They always seem a bit stale and are wrinkled from being smushed. The fabric steamer attachment is perfect for this! Here are my main tips for getting your home ready fo the holidays. If you are like me, the only time the tablecloths see the light of day is during the holidays. They have almost permanent creases from being folded for the whole year. I hate ironing clothes but huge table cloths are the worst. If you have an indoor clothes line, it is easy to hang the table cloth up and steam away or steam it while it is on the table before you set it. Even though I keep my holiday throw pillows in plastic totes in the garage I still feel like they need to be freshened up. At the very least they are stale (for lack of a better word). Most of the time holiday pillows are adorned with sequins, jingle bells, pompoms and other things that make us hesitate to throw them in the washing machine. 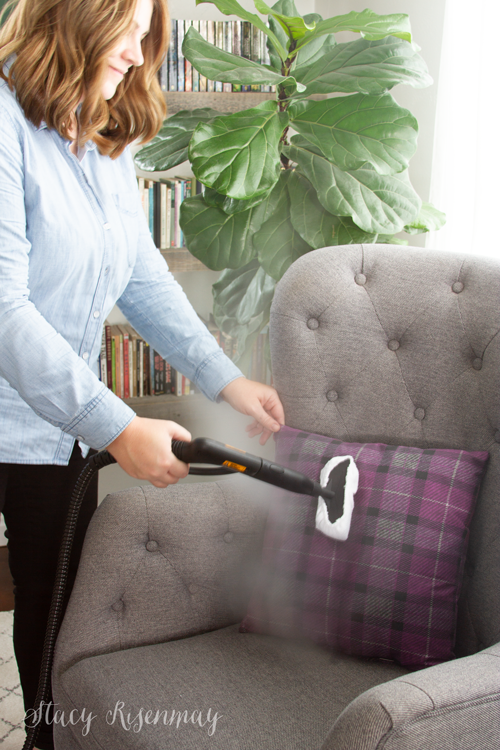 The steamer is perfect for killing germs and refreshing those pretty pillows without harming them. Tree skirts fall into the same category as throw pillows as far as not wanting to throw them in the wash. But they need to be cleaned up too. The hand held steamer is perfect! Do you want to know what I look forward to the LEAST when hosting a dinner or party? The fact that I have to mop before AND after the party. Make that task easier with the steam mop! Get your guest bathrom ready by steaming it! Toilets, floors, grout, sinks, showers, basically everything! With all the holiday dinners and extra baking, you will need to clean it all up before the guests arrive. Use it on stove tops, ovens, microwaves, dishwasher, floors, fridges, garbage cans, counters, and much more! Like this idea? Don't forget to pin and share!